Nomadic Skyscraper | gURROO - A new generation of innovative minds. The artist, like his creation, remains in a kind of two “universes” – the physical and imaginary (virtual) worlds. He is able to breathe life into his work, transform the Form from the liquid, illusory state in the material one. But sometimes the form itself offers its own scenarios of becoming, self-development. It tends to escape from the shackles of the material world, attached to the land state, static condition and regain its original status of a spontaneous, virtual substance. 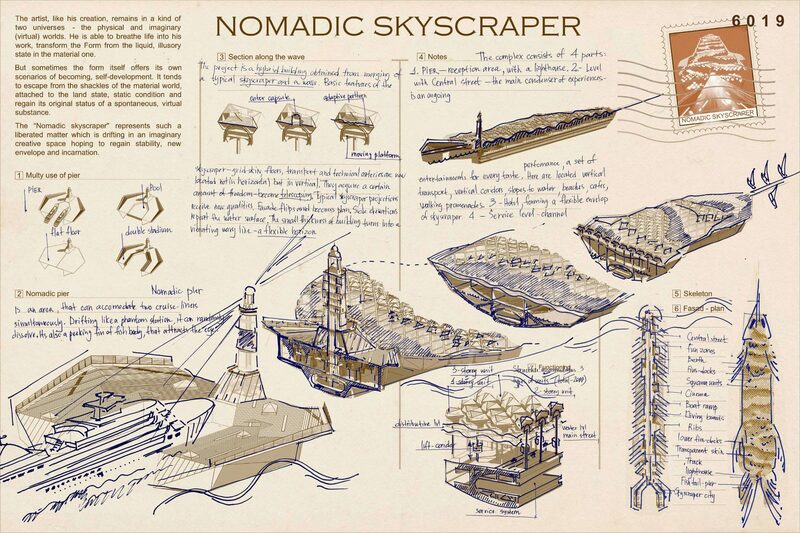 The “Nomadic skyscraper” represents such a liberated matter which is drifting in an imaginary creative space hoping to regain stability, new envelope and incarnation. Every year the stability of land gives way to the instability of the aquatic environment. Skyscraper – once the flagship of the architectural and technological advances responds to such a shaky situation and evolves. Skyscraper looks at the water surface, hedonistically admires its own ever-changing reflection, dreams to swap places with him. As in the myth of Narcissus, a metamorphosis occurs, skyscraper comes to life, turns into his own reflection. 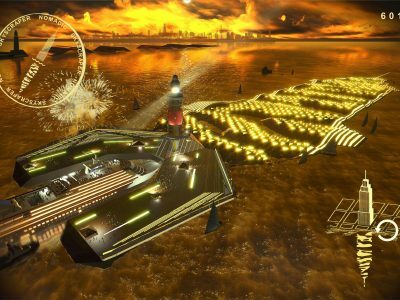 A material form acquires semi-virtual, fluid properties, gets a long-awaited mobility and sets sail. 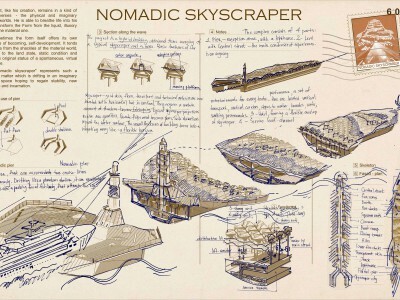 The “Nomadic skyscraper” is formed – a semi- chaotic, semi-ordered substance, a kind of mobile structure with the ability to morph his body. The project represents a flattened stepped skyscraper. 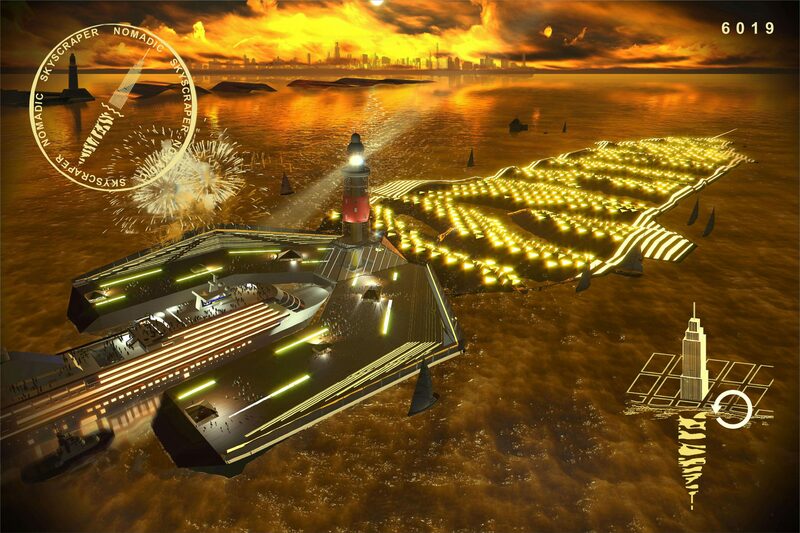 It is a flexible urban platform that with the minimum height has a huge area, supporting it on the water surface. Typical skyscraper projections receive new qualities. Facade overturns and becomes the plan. Side elevations (and longitudinal sections) of this flat skyscraper repeat and continue bends of the water surface. The small thickness of the building turns it into a vibrating wavy line – a flexible horizon.